Welcome! Hope you have fun! Probably Stairway to Heaven. Yeah I'm pretty sure it was this song. What would you do if you met a member of Led Zep? Tough question. Probably, I would just stand there and freeze. Then I would probably react to the situation, say Hi, thank him and tell them that they compose incredible music, then ask for an autograph. Yeah, I think that would probably happen. I hope it does come true. Well since I'm still young, I recall listening to Spice Girls and 'N Sync. Even though I started listening to Spice Girls when they were no longer together. It's okay if your answer a few of them. If you answer them all, that'll be great. Here they are. First a basic question, what is your name? How long have you been a fan of them? In your experience as a Led Zeppelin fan, what has surprised you the most? Describe the most significant moment you experienced involving Led Zep? In what ways has Led Zep influenced you? 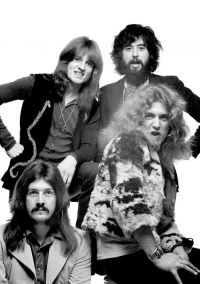 How has Led Zep influenced others? What makes Led Zep unique? What songs are the best? How would you describe them? Have your ever met them? Thank you so much for your time. Sorry about that. I think it's now complete.